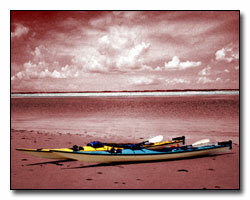 Sometimes you might want to combine monotone with color to produce a new look for your photograph. The history brush is very effective in helping to create that combination. 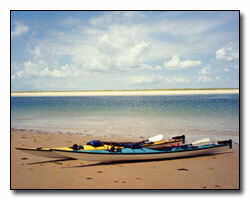 Note: The history brush will not work properly if the photograph is resampled or the image size has been changed. 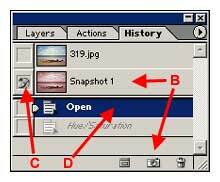 The snapshots that are indicated below are not saved when the finished photograph is saved. 2. 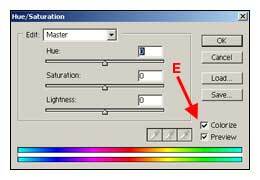 Hold the Ctrl Key down and hit the + key a few times to zoom the image to 100%. 3. 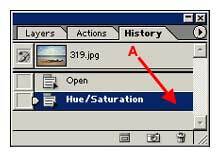 Choose Image --> Adjustment --> Hue/Saturation. Click the colorize box (E) and a check will appear. Click OK. The history screen will display the unsharpen mask as indicated in the image below (A). 4. Click the camera located on the bottom of the history screen (B). A snapshot of the photography will appear named as Snapshot 1 (B). 5. Select the history brush from the tool box and choose the brush size needed. 6. Click the box on the left side of Snapshot 1 (C). Click open on the history screen and the word open will be highlighted in blue (D). 7. Slowly paint the area that you want to appear in a monotone. You might want to use the Magic Wand to help isolate the sections that need to be painted. 8. You can add additional snapshots at any time if your image needs additional editing.